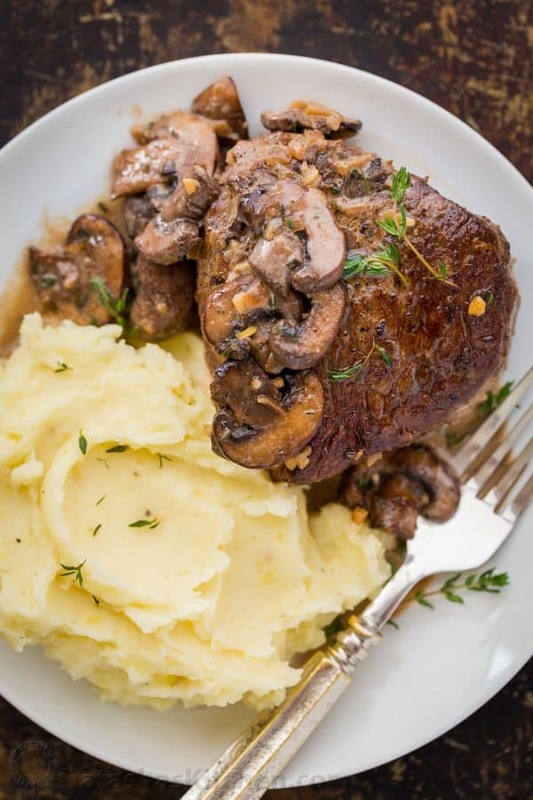 This pan-seared Filet Mignon recipe really and truly is an excellent way to make filet mignon. 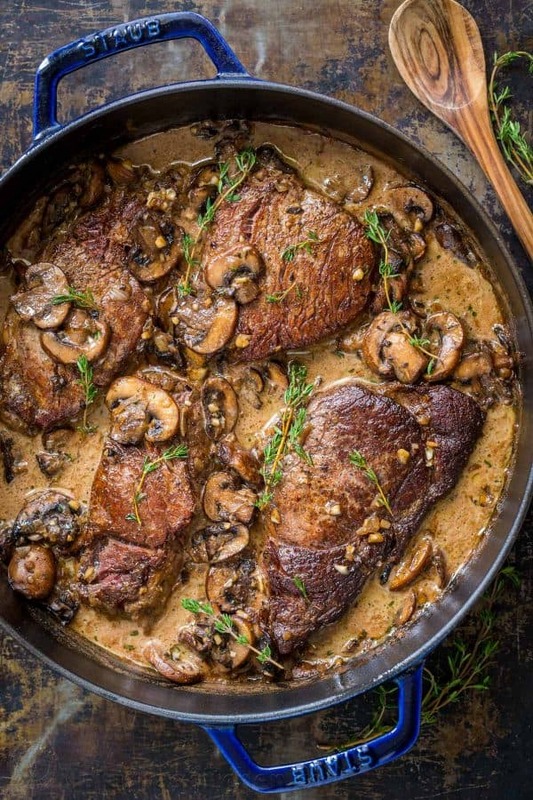 Searing the beef makes it melt-in-your mouth tender and every bite is so flavorful in that mushroom wine cream sauce. 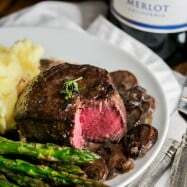 Make this filet mignon steak, served with creamy mashed potatoes and asparagus for your next special occasion and you will get rave reviews. Beef tenderloin steak is probably the MOST expensive cut of beef so it can be intimidating, but honestly it’s difficult to mess this up following the recipe. To give you an extra nudge of confidence, watch the video tutorial below on how to cook the best filet mignon. “Filet Mignon” is often labeled as “beef tenderloin”. It is the most tender cut of steak you’ll have. So tender, you could cut through it with a fork. 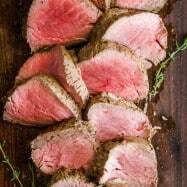 Beef tenderloin is sold either pre-sliced or as a whole or partial tenderloin. I prefer to purchase the whole tenderloin when I can so I can ensure even 1 1/2″ thickness and portions when sliced. The price per pound is often less when purchasing a whole tenderloin. What is the Best Red Wine for Cooking? Any drinkable red wine will work. DO NOT USE “cooking wine.” Even an inexpensive $7 bottle of Merlot like what we used here is a way better option. Using wine really enhances depth of flavor here. 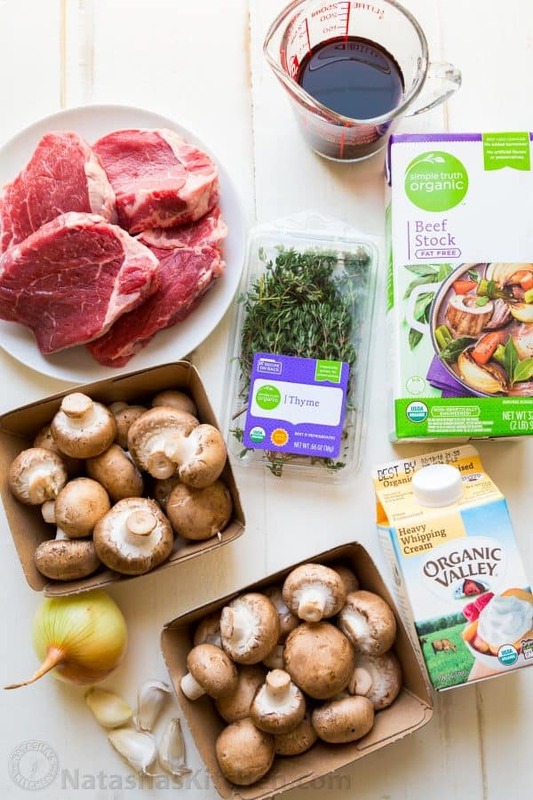 If you are looking for an alcohol free substitute; you could use more beef broth and it will still taste great but more like a mushroom gravy. It is ‘fancy restaurant’ quality without the insane price tag. We spent $40 to make an amazing filet mignon dinner for 4. If you enjoy our videos, please subscribe to our Cooking Channel and click the bell icon to be the first to know when we post a new video. We included Amazon affiliate links to our favorite cooking tools. 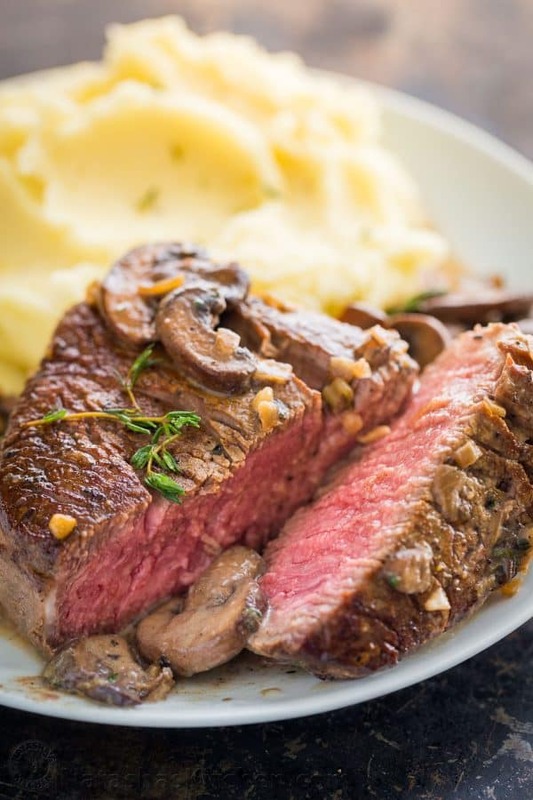 This pan-seared Filet Mignon recipe really and truly is an excellent way to make filet mignon. 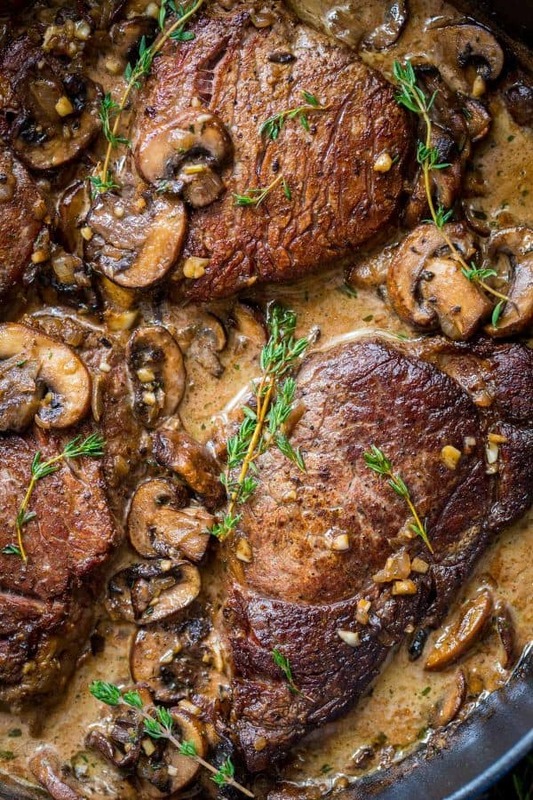 Every bite is so flavorful with that light mushroom wine cream sauce. Searing the beef makes it melt-in-your mouth tender. Place a large heavy-bottomed pan over med/high heat and melt in 2 Tbsp butter and 1 Tbsp oil. 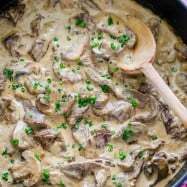 Add sliced mushrooms and cook 6 min or until softened and most of the liquid has evaporated. Add diced onion and cook 3 min, stirring often. Add minced garlic, 1 Tbsp thyme, 1/4 tsp salt and 1/8 tsp black pepper. Cook, stirring constantly, 2 min or until garlic is fragrant. Transfer mushrooms to a large plate. Wipe pan clean with a wet paper towel. Season steaks all over with 1 tsp salt and 1/4 tsp black pepper. Place the same pan over medium/high heat and add 2 Tbsp butter and 1 Tbsp oil. 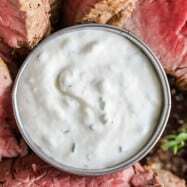 When the butter is hot and finished foaming, add seasoned steaks and sear 3-5 min per side for medium-rare (5-6 min for medium doneness*), turning once. When steaks reach desired doneness, transfer them to the plate with mushrooms. In the same pan over med/high heat, add 1/2 cup red wine and boil down until reduced by half (3 min), scraping the bottom to deglaze. Add 1 1/2 cups beef broth and boil until 2/3 cup of liquid remains in the pan (5-7 min). Stir in 1/2 cup cream and boil 2 min or until slightly thickened. Season sauce to taste with salt and pepper if desired. 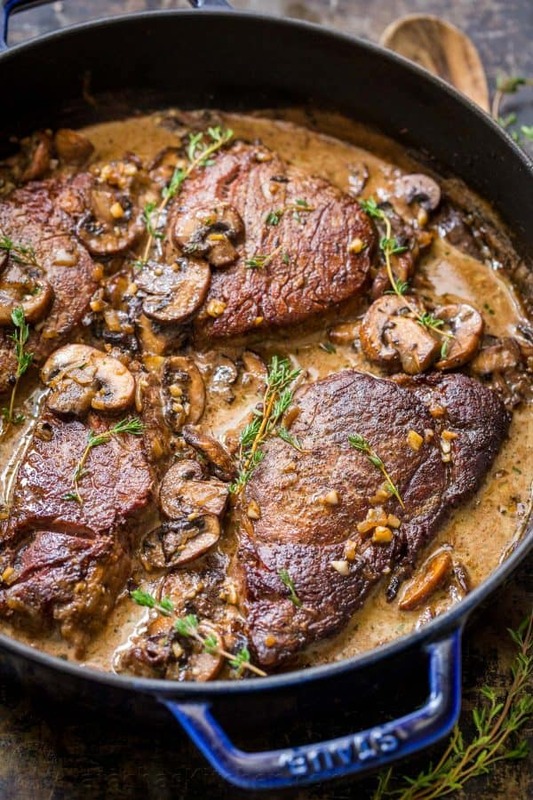 Add steaks and mushrooms back to pan, spooning some of the sauce over steaks. Once steaks are just heated through, remove from heat and serve garnished with fresh sprigs of thyme if desired. *Note on Steak Cooking Times: Searing time will vary based on desired doneness and thickness of steaks. MOUTH IS WATERING just thinking about it because I know just how completely amazing it tastes!! I hope you fall in love with this pan-seared filet mignon. It is a meal to remember! Love your idea Next time l make some l will def be giving that a try. Hey there! 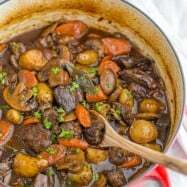 Made this recipe for my fiance on our anniversary and he absolutely loved it! It turned out perfect. This meal is the absolute bomb! It was simply fantastic, very recommended and affordable dinner! Oh my goodness. 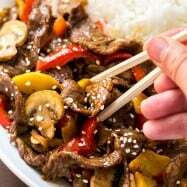 My husband said that this is the tastiest steak he’s EVER had – this is so very good, Natasha! This is, by far, my favorite preparation of filet mignon I’ve ever tasted. I made mine medium-well and served it over mashed potatoes as well. Wow this is a super yummy sauce! I happened to buy the worst, most chewy piece of meat possible that tasted like cows tongue..but even then my pro meat-grilling guy said it was really good. We had it with mashed potatoes. Thank you for the incredible recipe. Love your recipies…….so simple to make & delicious.